John Anthony Cangelosi was born on March 10, 1963 in Brooklyn, New York. The small five foot eight inch, switch hitting Italian American, played hard to make up for his size. After attending Miami Dade Community College, he was signed by the Chicago White Sox in 1982. He stole 87 bases at A ball Appleton, in the Mid Western League, making the All Star team there getting promoted quickly to AA. At AA Glen Falls, he hit .287 & was second in the league in stolen bases (65) as well as in runs scored (91). He made a brief five game appearance in the majors with the White Sox in 1985 debuting in centerfield on June 30th going 0-3 in game against the Minnesota Twins. In 1986 he was the surprise of the White Sox Spring Training camp, taking the centerfield job away from future Met Daryl Boston, as well as Rudy Law. Cangelosi only hit .235 that season, but stole 50 bases, second most in the American League. He walked 71 times, which gave him a .341 on base %. He also hit 16 doubles and drove in a career high 32 runs. The next season he was traded to the Pittsburgh Pirates for Jim Winn. In the Steel City he raised his average to .275 his first season there (1987). 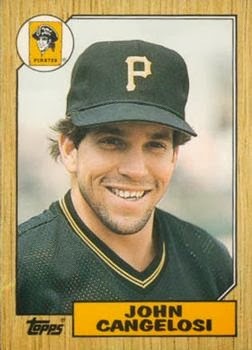 On a Pirates team with Bobby Bonilla, Barry Bonds & Andy Van Slyke he posted a team best .427 on base % for Jim Leyland's fourth place Pirates, with 21 stolen bases. He spent four years in Pittsburgh winning an NL Eastern title there in 1990 but only hit .197 in 58 games. After spending all of 1991 in the minors, Cangelosi signed with the Texas Rangers for one season batting just .188 in 73 games in 1992. He signed with the New York Mets as a free agent for the 1994 season, getting a chance to return home to the New York City area. Cangelosi began the year as a pinch hitter & reserve outfielder. He debuted in the second game of the season, as a pinch hitter going 0-1 in a 6-2 Mets win over Houston. On April 14th, he got a pinch hit single, stayed in the game later drawing a walk & scoring two runs. He went 2-6 as a pinch hitter and batted .350 in the month of April. In a May game in Montreal, he had a four hit day, driving in a pair of runs leading the Mets to a 3-2 win. That month he had 14 hits seeing the most action of the season, 23 games, playing all outfield positions. 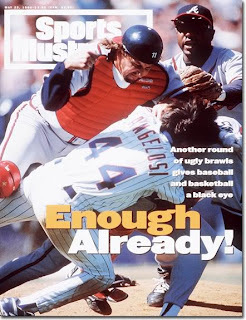 Famous Brawl: That summer in a game against the Atlanta Braves, Cangelosi got plunked by John Smoltz after Ryan Thompson took his time rounding the bases hitting a grand slam. Cangelosi charged the mound only to get tackled from behind by former Met, catcher Charlie O’Brien. It was the first time Cangelosi had ever charged a mound in his career. But there was also a history between the two, Smoltz had hit Cangelosi with a pitch earlier in the year. Cangelosi said “Obviously, Ryan Thompson hit a grand slam and he was frustrated. We were hitting him pretty good today. But just because someone's hitting you and you're not doing your job, that doesn't mean you should hit somebody else." The brawl received national attention, getting the cover of Sports Illustrated that summer. All in all Cangelosi was released at the end of June as the Mets team continued to struggle. For the ’94 Mets he played in 62 games batting .252 with five stolen bases which were enough to lead the slow footed team. Of his 28 hits, he had four doubles, drove in four runs & posted a .371 on base %. Over the next few years he would go on to be a backup outfielder with Houston Astros (1995-1996), Florida Marlins (1997-1998) & Colorado Rockies (1999) . In the 1995 season he stole 21 bases in Houston, batting a career high .318 playing in 90 games. 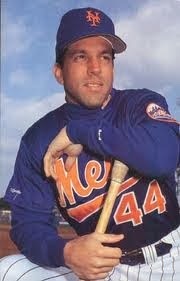 He stole 17 bases the next year, before moving on to the Florida Marlins for 1997. In July of 1997 he became the first Marlins position player to pitch in a game. In his career he would make three pitching appearances, never allowing a run in four innings pitched. 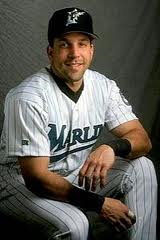 He appeared in 103 games as a utility player for the 1997 World Champion Marlins, batting .245. Post Season: After an 0-1 NLDs appearance, he got into three games of the NLCS (going 1-5) in the win over the Atlanta Braves. He then went 1-3 in three games of the World Series win over the Cleveland Indians. Retirement: He finished his 13 year career in 1999 batting .250 with 501 hits 12 HRs 73 doubles 134 RBIs 154 stolen bases & a .370 on base %. He played 617 games at all outfield positions & pitched in three games. 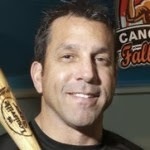 After his playing days he started the successful Cangelosi Baseball Academy, which he runs inside the Bo Jackson Elite Sports Dome in the Chicago area.